B.A. (1996) Kothelawela Defence University, Sri Lanka, Post graduate Diploma, Faculty of Human Resources Management, University of Kelaniya, Diploma In journalism, University of Colombo. Sri Lanka Military Academy Regular military officers’ Course (42-B), Commissioned infantry Officer in the Sri Lanka Army. Study on Varied Media Reporting on Armed Conflicts and its impact in South Asia. Major Hemantha Dayaratne is an infantry Officer in the Sri Lanka Army. He joined the Army in 1993 and after his graduation and commissioning he fought battles against LTTE till the end of the year 2000 as an infantry officer. He twice injured in battles and after his recovery he was posted in the Military Spokesman’s Office of the Sri Lanka Army (www.army.lk) as a Staff Officer. With his new posting He changed his path towards military- media relations. 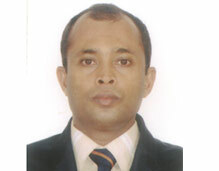 He has been working in the field of military-media relations for ten years in the Sri Lanka Army todate. Presently he is in the editorial Staff of “The White Hackel”, the pioneer Sri Lanka Army quarterly and the journal of the Sri Lanka Light infantry.